Michael Haneke: Unpredictability, Spectatorship & Minimalism. Michael Haneke is arguably the most discussed and debated contemporary European film maker. Having directed both television and theatre, and having worked briefly as a film critic, Haneke started directing cinema at a later point in his career. His films have divided audiences with their unpredictability and their often violent nature. Criticisms of the middle classes along with his negative feelings towards meaningless entertainment combine to form the underlying tensions and messages of Michael Haneke’s work. Haneke is not afraid to challenge his spectator. Throughout his career he has used cinema to create uncomfortable atmospheres for the audience. Yet, there is a precision and simplicity that he applies to his aesthetic that combines with the stories he tells, making his body of work visual stunning, deeply moving and incredibly important within the contemporary landscape of world cinema. Haneke’s films relies heavily on ‘counter-cinema’. It takes the spectator’s reaction and involvement in his work to complete the piece. Some films rely more heavily on this than others. For example, Funny Games attempted to make the spectator suffer, watching a film about a family being tortured in their own home. Haneke wanted the audience to struggle with the topic as an attempt to respond to the mindless conventional horror films that American audiences consume. His early work, such as Benny’s Video, dealt with similar displays of raw violence and unpredictability but it was not until 2001 that he produced his first true masterpiece. The Piano Teacher, telling the story of a sadomasochistic pianist and her volatile affair with a younger student, combined an elegance and an ugliness that Haneke had not achieved before. The film incorporated immense stillness with sudden moments of grotesque bodily harm and mutilation. This play on the melodrama dealt with repression in a way that has since returned in his later work. In 2009 Haneke won his first Palme d’Or for his suffocating drama The White Ribbon. (He remains one of only 6 directors to win more than one). A film that looks at suffering, repressed desire and unexplained and unsolved violence, The White Ribbon made great use of the static camera and long takes in order to capture the turmoil that was being experienced on screen. 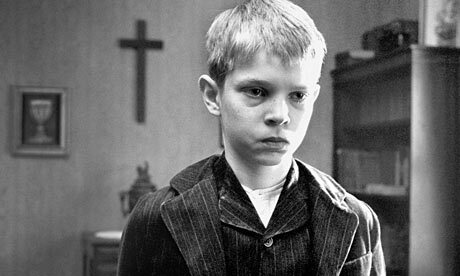 One scene depicts a young boy, Martin, having to admit to his manipulating father that he has been giving in to his sexual urges. Mortified and broken, Martin remains still, attempting to contain his emotions. This remains one of the most moving cinematic scenes to come out of European art house cinema in the last decade. Haneke’s aesthetic combines the use of the interior space, a stationary camera and a slightly de-saturated colour palette to capture the bleakness of the stories he tells. His typical mise-en-scène appears to be influenced by his days as a stage director; the shots being more theatre like. This minimalistic approach to the aesthetic has been described by film scholar Catherine Wheatley as “clinical”. The individuality of his style has gone on to inspire many other European film makers who are currently working. Austrian film maker Markus Schleinzer’s Michael, for example, was blatantly inspired by Haneke’s cinematic image. With his heavy influence over other talented film makers and his consistent themes, styles and signatures, Haneke is undoubtedly a cinematic auteur. His films are always unpredictable, often ambiguous and, in the words of writer Ricardo Domizio, “never an ‘easy ride’.” (2011) Michael Haneke excites, punishes and moves his audience; continuing to prove that there is no story too sad, too violent or too ugly that can’t be told through the power of the cinematic image. Tags: Amour, Benny's Video, Cache, Funny Games, Hidden, Spectatorship, The Piano Teacher, The White Ribbon, Time of the Wolf. Bookmark the permalink. Previous post ← Saving Mr. Banks.